The Unidentified Trawler is a contemporary steel hull fishing vessel sunk in Stellwagen Bank National Marine Sanctuary. At this time, the identity of the vessel and cause of sinking is unknown. The wreck exists as 3 main pieces with 2 areas of debris. The visible sections of hull show blue and white paint. There is a single trawl net reel a short distance from the main wreckage. We believe this is most likely a western rig stern trawler design, though we cannot be completely certain based on available information. It is estimated that the trawler likely sank between 1970-1990. This is an interesting and fun dive. As mentioned, the wreck has 3 primary sections, which is comprised of the pilot house, a hull section and the stern hull section. Further away is the netreel drum. Around the wreck site various bits and pieces can be seen depending on whether is wreck is more or less sanded in. The pilot house is most likely where the clues to the identity of the wreck exist. Here, uniquely shaped windows are observed along with brass window frames and portholes. Inside the pilot house, the partial helm and throttles remain along with radio equipment. The pilot house is truly unique and there aren’t any other wrecks around here that have an intact pilot house sitting upright in the sand. Elsewhere on the wreck, marine life can be found hiding in and under wreckage. Like many sanctuary sites, it is not unusual to see wolffish, large lobsters, longhorn scuplin and other fish. The visibility is usually good at 15-30 feet, but current can be strong, even during the slack water period. 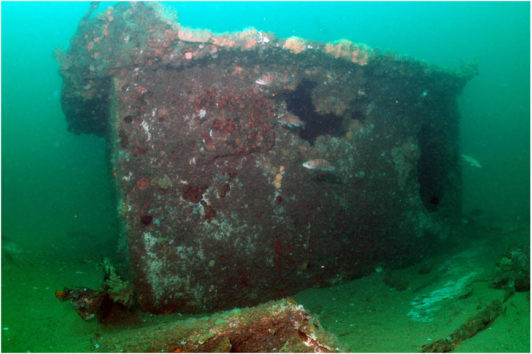 This wreck was the first site for the pilot sub-sea mooring system installed under a Project Aware Grant. The mooring has moved slightly and as of 2015 was off the end of the stern. The mooring may be relocated and an updated site map will be available soon.